We had never eaten either winter radishes or radish seed pods, and so tried both a while back (besides, of course, ordinary radishes). Neither sounded really exciting, but you never know until, so each got a trial. Our experience after trying winter radishes was that there is nothing notable about their flavor, and their texture was—to us—inferior, plus who can deal with so much radish at one time? We give up on those. Of the radish seed pods, we lazily let most get away till they were well past prime, and thus bitter, but the few we tried in salads and stir fries did not cause the Earth to move, and we give up on those too. If you want novelties, you can further research both types. For common salad radishes, the choices are many, but the literature does not suggest any notable difference in eating quality. Perhaps the biggest difference is suitability for growing in the summer (radishes, like all Brassicas, being cool-weather crops). Ultimately, after inordinate amounts of time wasted on false trails and hybrids, we came to the conclusion that the open-pollinated types Belle Glade and Sora are the best heat-resistant radish types (and perhaps the only open-pollinated ones). But Belle Glade does not seem available to home gardeners, and the Sora type is scarce. As you are about to see, however, no loss. It is no loss because we have come to the conclusion that we prefer to grow our radishes indoors—they take up little space, we have some available in our indoor growing area, plus we can contain their soil and replace it periodically without clubroot fears. Thus, the hardiness of the type doesn’t enter into it, and we can choose freely. That said, though most types will obviously do ok in a container, the best choices will be the small globe types—the faster-growing, the better. If, within that class, there’s any advantage to one over another, we haven’t been able to discern it. The variety Early Scarlet Globe sounds like just what is wanted, and it is; but "early" here means 22 days compared with the 25 that is the norm for small radishes, so if you prefer the fun look of the Easter Egg type—which comes out in various colors—or the all-white Hailstone (shown at the left), go right ahead with one of those. Anyway, most of the following remarks apply equally to radishes grown in-ground or in containers. Radishes are famously easy to grow, being often recommended as a first vegetable for children to try growing. The one vital caution about radishes is the need to recall that they are, after all, Brassicas, and so if grown in-ground need either to be rotated on at least a four-year cycle or else grown in a small, isolated spot of their own. In summer they can go in amongst the various other Brassicas; but in winter—if one wants to grow them continuously—they need special treatment. We would grow them in a dedicated container, outdoors or indoors, and annually dump the soil out somewhere far from any growing areas; that may be overkill, but better safe than sorry for the ten years one has to wait out a clubroot infestation. The too-frequently given advice to intercrop radishes with non-Brassicas is likely pretty bad advice, though one source says they grow and are picked so quickly that clubroot doesn’t have a chance to develop; our philosophy is, again: better safe than sorry, especially when it’s so very easy to be safe. If one is growing radishes year-round, one simply sows a little more seed for every few radishes pulled. If not, do the same thing anyway till, by not emerging, they tell you that it’s too cold for them. Start sowing again “as soon as the ground can be worked”, meaning when you’re not chipping ice to scratch the soil. 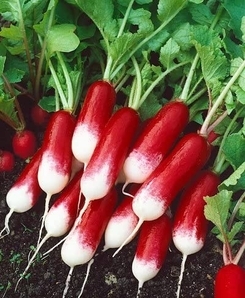 Radishes prefer light, rich soil, but will usually grow in pretty much any garden soil. If, as we do, you grow your radishes in a container, remember to discard and replace the soil at least annually, to avoid risk of clubfoot disease. Be sure that the discarded soil is truly discarded, quite some long way away from anywhere you are, or ever might in future be, growing Brassica vegetables. Being fast-growing, radishes are invariably direct-seeded; being small, they are invariably planted out densely, typically at a 2-inch spacing; being wanted constantly, they are normally succession-sown, on whatever basis is comfortable for the gardener (from daily to weekly). Plant the seed about ½ inch deep. Radishes are not frost-tender; if you have a sunny, protected spot you might be able to get them through most of the winter (but don’t put them in your protected lettuce bed, if you have such, for the reasons noted above). Seedlings usually emerge in a mere 3 to 4 days. Water your radishes well and frequently—lest they become pithy or over-hot in taste—wait 3 weeks or so, then pull; their maturity is listed as typically 25 days or so, and most sources say “3 to 4 weeks”, but if you’re succession cropping, you might as well pull them fairly early, to avoid unwanted bitterness (the chief bane of radishes). In summer (when the temperatures are over, say, 80° or so) providing some partial shade is a good idea. Radishes grown for their edible pod (special types, usually called “rat-tail”) need to be harvested quite young, else the seed pods turn very bitter. Radishes are, of course, of the Cruciferae, the cole crops, as are most slightly bitter hot-tasting vegetables. Ordinary garden radishes are Raphanus sativus, but the “rat-tail” sort are R. sativus caudatus (and their “radish” root is not very good eating—they are grown only for the seed pod); “Oriental” or “winter” radishes are R. sativus niger. There is also a race R. sativus oleiformis, the “fodder” radishes, which are grown mostly for their leaves and oil-rich seeds and as a green manure or stock feed (though they can, in principle, also be eaten by people). Garden radishes have some close cousins: R. landra, a wild radish; R. maritima, the “sea radish”, a wild radish found in sea-coast areas and somewhat horse-radishy; and R. raphanistrum, the “wild radish”. All those types have edible qualities, but not for the familiar root: the young leaves are a rustic potherb. In Oaxaca, Mexico, artists carve long radishes into elaborate sculptures, typically of animals, for La Noche de los Rabanos, the night of the radishes. You loaded this page on Friday, 19 April 2019, at 17:03 EDT. It was last modified on Saturday, 2 February 2019, at 19:31 EST.